It’s time to see Cyprus and it’s properties! We fully take care about your comfort – good hotels, transfers, warm sea, presentations of villas and apartments, consultations with specialists. We will help you get residence permit in North Cyprus without any problems. We know how to get rid of hard situations. Friendship starts with a smile, in our case with a present too. Club card will give you bonus discounts for all your needs, for all furniture and appliances and even cars. "Incirli" - is a beach, restaurant and a motel of "Monolith" group of companies. Spend a romantic weekend on the beach of Mediterranean sea! 70 dollars, no only 50! dollars per a room per 2 person, Mediterranean breakfast include! The weekends is ideal for a change of scenery. We offer you a beautiful restaurant with cypriot cuisine, sandy beach with free umbrellas and beds, water sport. 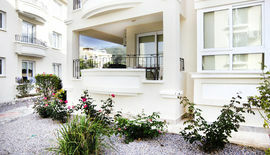 Accomodation offers only three rooms, every room has a balcony with a beautiful view. In the rooms there are a double bed, wardrobe, cupboards, also if you wish we can install a bonus bed or a sofa for a third person( child). Fridge, TV-unit, AC, kettle are also available. In a walking distance from the motel you can find buses which you can get to go to the center of Kyrenia, also tourists can get to other restaurants, cafes, bars, karaoke, casino, or just have a walk around the historical center of the village. The place where the motel is located is called Lapta. It's known for it's natural beauty and popular for tourists from all ages as well as the local people. The only thing that stands between Lapta and Kyrenia is 15 km. So to be in the center of the bright and vibrant night life of the island can be fast to get to, and later return back to tranquility of pastoral life. In Lapta there are several historical places, which are worth to look at. The village is located on a territory of Lapitos, which was ma approximately 3.5 thousand years ago. Later, in the Roman Empire Lapitos was renamed to Lambossa. Now these names are reminiscent of the same name hotels that are within walking distance from our motel. In “Lapitos” hotel there is an aqua-park for children, in “Lambossa” hotel there are a casino and luxurious spa center (this is an answer for one of the questions about entertainment on Cyprus). Also on Saturdays you can visit local market which is also called "Lambossa". Here they sell home made, second hand, crafts and you can also find truly valuable antiques. As for the monuments - on the coast there are ancient roman swimming pools with sea water in them. Some legends are saying Romans bred fish in them and in another it's the remains of ancient baths, which Romans were famous for. A bit further from the pools, there are ancient tombs where many interesting things were found. Later monuments consist of church of saint Evlalios and monastery "made without powerful hands". According to the legend it was moved to Cyprus from Asia by the will of saint Maria, the Mother Of Jesus.